Hey guys. We had quite the storm over the weekend. It was intense. I'll share more about that in a moment, but first things first, it's Inspiration Monday with two birds (congrats again to Miss Megan on her wedding this past weekend!) and they chose this awesome casual look from Alessandra Ambrosio. This was easy. Comfy shorts, my current favorite peach top, sandals and a necklace. Boom. Simple and chic. Mr. Monkey was kind enough to take my pictures yesterday. Yesterday ended up being a rather nice day. The rest of the weekend? Totally different story. It all started Friday night. We were over at our music director's house having a Friday night rehearsal. Suddenly we all started getting government issued text messages that there was a Flash Flood warning in our area. I looked outside and it was getting dark, but not raining. I checked my Weather Center app and saw that there were severe storms approaching, but didn't think too much of it. We get storms, it's not a big deal. Well pretty soon the sky just opened up, I have never seen rain come sideways quite like it did. You could see it was windy. The lights started flickering and then the power went out. So, rehearsal was pretty much called off at that point. The Pants Monkey and I decided to head home when there was a brief lull. We only live a few blocks away, so at least it wasn't far to go. It was quite a drive though - lots of limbs and standing water in the road. We got home and thankfully we had power. Everything seemed more or less ok, but I was nervous because we have had water come in the basement before in these kinds of storms, sometimes it just takes awhile. And sure enough, Saturday morning my fears were confirmed when I found water in the laundry room and a little bit on our main room carpet. We need to grate the lawn away from our house in the backyard is what it boils down to. At any rate, we spent the rest of the weekend dealing with that. It's slowly getting better, but I think we're getting a new de-humidifier to speed up the process, the one we have seems to have failed! Despite all of that, we salvaged a decent day yesterday. The Pants Monkey brewed beer and we had dinner out on a patio. I tell you though, I feel like I need a weekend from my weekend! 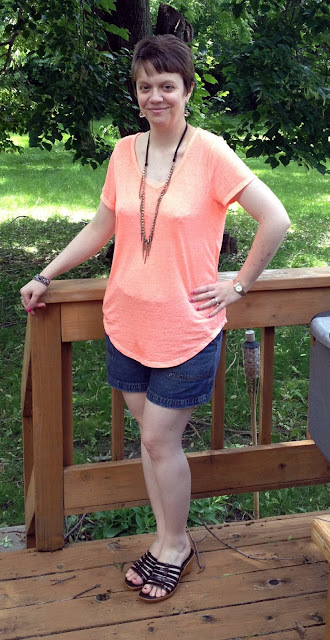 For more Inspiration Monday outfits head on over to two birds over here. Sorry to hear about the water in your basement! We spent the weekend at my parents due to their basement flooding. Thankfully we didn't loose any large branches (or our tree), but we did loose power. Cute outfit for yesterday! So glad you are safe and had power! Peach is a good color on you! Glad the storm wasn't worse. You look really cute in this simple outfit. Such crazy weather - I'm glad you're safe! Very cute! I love the color of that top! Oh man, I am glad that you guys are okay! I feel you on the busy weekend! Oh man! That stinks about the water in your basement. We've been having crazy storms here too lately and the streets keep flooding. What an eventful weekend! Hope everything is drying out. Sorry about the water! We had some of the sudden storms today. Lots of random high winds, mixed with bright sunlight randomly. I'm glad you all are safe though. Stay safe! We were camping for part of the weekend, and woke up in a puddle. Thankfully, we were in a GREAT tent and everything was dry inside!